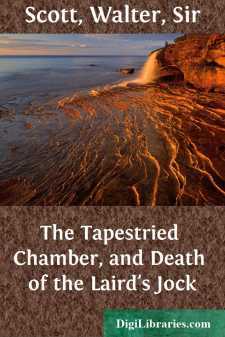 THE TAPESTRIED CHAMBER; OR, THE LADY IN THE SACQUE. The following narrative is given from the pen, so far as memory permits, in the same character in which it was presented to the author's ear; nor has he claim to further praise, or to be more deeply censured, than in proportion to the good or bad judgment which he has employed in selecting his materials, as he has studiously avoided any attempt at ornament which might interfere with the simplicity of the tale. At the same time, it must be admitted that the particular class of stories which turns on the marvellous possesses a stronger influence when told than when committed to print. The volume taken up at noonday, though rehearsing the same incidents, conveys a much more feeble impression than is achieved by the voice of the speaker on a circle of fireside auditors, who hang upon the narrative as the narrator details the minute incidents which serve to give it authenticity, and lowers his voice with an affectation of mystery while he approaches the fearful and wonderful part. It was with such advantages that the present writer heard the following events related, more than twenty years since, by the celebrated Miss Seward of Litchfield, who, to her numerous accomplishments, added, in a remarkable degree, the power of narrative in private conversation. In its present form the tale must necessarily lose all the interest which was attached to it by the flexible voice and intelligent features of the gifted narrator. Yet still, read aloud to an undoubting audience by the doubtful light of the closing evening, or in silence by a decaying taper, and amidst the solitude of a half-lighted apartment, it may redeem its character as a good ghost story. Miss Seward always affirmed that she had derived her information from an authentic source, although she suppressed the names of the two persons chiefly concerned. I will not avail myself of any particulars I may have since received concerning the localities of the detail, but suffer them to rest under the same general description in which they were first related to me; and for the same reason I will not add to or diminish the narrative by any circumstance, whether more or less material, but simply rehearse, as I heard it, a story of supernatural terror. About the end of the American war, when the officers of Lord Cornwallis's army, which surrendered at Yorktown, and others, who had been made prisoners during the impolitic and ill-fated controversy, were returning to their own country, to relate their adventures, and repose themselves after their fatigues, there was amongst them a general officer, to whom Miss S. gave the name of Browne, but merely, as I understood, to save the inconvenience of introducing a nameless agent in the narrative. He was an officer of merit, as well as a gentleman of high consideration for family and attainments.